Why choose DynaMop® over all other brands?? When you expect the very BEST spin mop, DynaMop® is there! * 10x times longest lasting spinner! * Environmental friendly,100% well made in Taiwan by original inventor/developer. * Easy wring: Time & energy saver. $$ well spent on worthy product, never cheaply made! The video clip above is relevant to our "Stepper" model foot pedal type spin mop. The "Plunger" model hand pressing style spinning mechanism is built into the handle and is different from this video. Yet, it's a Gold Medalist at [Paris Concours Lepine Int'l Invention Show] high performance patented design. Always True Value: No gimmicks, simply best utilization of leverage for best performance, fastest spin, longest lasting and best cleaning results. Plus extra mop-head for additional value. Meanwhile, it cleans better and make mopping even easier! * No more wringing! DynaMop® spin mop greatly cut down work and save time! * Use in kitchen, bath, rooms, RVs, boats, car wash, etc. * Centrifugal force spin dry clocked over 2500 rpm (foot pedaling) & 3500 rpm (hand pressing), fastest spin mop on the market. * Uniquely made FLUFFY type microfiber mopheads, use with bleach, cleaner, ammonia, liquid polish, etc. Also machine washable. * Newest DynaMop® [SPIKY] mop-head, U.S. Patent #9730569 issued 6/15/2017 marks the ONLY mop-head to pick up human and animal hair effectively. * Use as duster, dry mop, or wet. * The commercial grade household product made to last. In May 2009 DynaMop® made its debut in USA with formally registered trademark and introduced its first generation high quality spin mop. Three years later by year 2012, dozens of makers followed to enter into the U.S. market with many cheaply made lower quality and often lower priced look-alike. DynaMop®'s relentless R&D efforts left all second brands far behind. Ideal spinning mechanism designs brought about highest spin speed and best performance. We aim to provide best value to our customers and make every penny of the initial investment count. Every DynaMop® product has been 100% well made in Taiwan by the inventor/developer at the ISO 9001 factory base to ensure highest performance and greatest durability. Among the company's breakthrough technologies are the adoption of clutch design in the hand pressing spin mechanism, the advanced expansion claw driven planetary gear system for the foot pedal spinner and the newly developed "Spiky" microfiber mophead that picks up hair effectively, all of which are internationally patented DynaMop® inventions. To this date in 2016 while all 300 some makers are still dependent upon ball bearings to drive a spinner basket in the spin mop, DynaMop® has long been advanced (since 2012) to its own exclusive award winning non-abrasive lifetime ever-lasting "Expansion Claws/Flippers" device along with planetary gear construction. The innovative device is lab tested to outlast ball bearings more than 10 folds (250,000 vs. 20,000 pedaling steps). DynaMop® foot pedal model also comes with award winning lifetime spinning mechanism that delivers more than 2500+rpm spin speed, absolutely and by far the best spin mop system on earth! 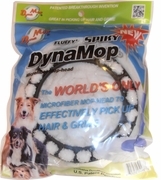 * Forget the sappy or soppy: DynaMop®'s spin mop innovative Dyna-Spin™ mechanism eliminates soppy mops. The hassles of wringing are non-existent with an all-in-one step bucket that activates centrifugal spin in the embedded basket. * Make the difficult effortless: DynaMop®'s disk-shaped head, ergonomic handle, adjustable arm, and swivel base make it comfortable to handle and easy to clean difficult-to-reach areas. It really is quite a versatile cleaning buddy. * Be Exclusive: DynaMop®'s durable construction is one-of-a-kind and will outlast your traditional mops as well as ANY spin mops on the market. Its cleaning discs are machine washable and easily replaceable, making the system a real keeper. Time to retire all the others, for good. * No need to travel far and wide for love: This cleaning sensation is now making its home right here. Thanks to the DynaMop® spin mop, you may be reunited with your love for cleaning!